Nancy Berk slept here. Really. This month, Target launched a back-to-college marketing campaign that gives every college-bound kid and their parents a reason to shop. The retailer has captured a family-driven milestone and the myriad of emotions, needs and wants associated with it, while providing problem-solving solutions that are easy on the eyes, if not so much on the pocketbook. In a four-day live stream event, Target featured five YouTube personalities living in mock Target-designed dorm rooms. Maybe Target hit the nail on the head, but I think they missed one of the boats when they cast this reality series. They should have put a parent in one of those rooms. I know this, because I’ve lived it. Last month, I spent one very memorable night in a dorm room. As a presenter at a university writers’ workshop, one of my “perks” was free lodging in one of the school’s empty dormitories. To be honest, I balked at the invitation when it was first issued. 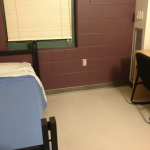 Dorm living was a fond memory for me, but I was glad to pass that experience on to my sons. When it comes to living accommodations, I find that kids tend to be more resilient and forgiving than their parents. Sure, some dorms are like palaces, but others could be used quite convincingly for a film incarceration scene or two. I contemplated refusing the generous lodging offer, then thought about the opportunity. I’ve been writing about college for years now. Spending the night in a dorm room decades after I graduated from college was the perfect catalyst for a story. What I didn’t anticipate was that the experience would lead to an inspired marketing suggestion for Target. Here’s how it happened…. Eight hours is a very long time when you are laying on the smallest, most uncomfortable bed on the planet surrounded by cinder blocks and drab paint. Before my head can even hit the custom-issued flat pillow (possibly manufactured in 1963), my brain is on a Bed Bath and Beyond walk about. I know now why most college students are jealous of kids who live locally and can live in a nice big house or jealous of a Cultural Care Au Pair who can go to college and then go back to stay in their host’s house and not have to suffer the dorms. If only I had access to memory foam anything, sleep could be within my reach. Old parenting lectures pop into my head – if you can’t sleep, then make good use of your time. I reach for reading material, but the light bulb on the ceiling only casts enough light to make it clear I’m definitely not a co-ed. I long for that cute little lamp in last Sunday’s Target flyer. Somehow I sleep, but not well. I make an early morning dash to the community bathroom to beat the rush (Plus, what stranger needs to see you without coffee and makeup?) and learn that my shampoo is still in my suitcase. This never would have happened if there was a color-coded shower caddy in the picture. I dry my half-clean hair in front of a cloudy mirror where it’s impossible to distinguish your frizzies from the scratches and realize that all of my problems could have been solved with a little retail therapy. So Target, here’s my highly targeted suggestion. If you want to see a boom in college-bound sales, put a baby boomer parent in a dorm room for 24 hours and watch your merchandise fly off the shelves. Every college-bound student (especially a boy) needs a concerned mother who knows what dorm rooms are like — or a good gay male friend.